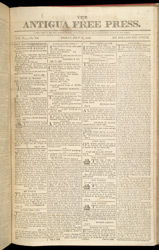 Front page of the Antigua Free Press, dated 17 July 17th 1829. It carries advertisements for the sale of estates, land and food - and also for enslaved people. The advertisement 'Negroes for sale' clearly shows how slaves were regarded and treated as commodities - to be sold on whenever it suited their owners.